The Brush Athletic Department has established a new award called the Love Award. The award will be given at home football games to honor those that “LOVE” Brush Athletics and dedicate their time and talents to assist in running our athletic program and events, much like the award’s namesake Rick Love did during his tenure in the South Euclid Lyndhurst Schools. Rick Love was a longtime teacher, coach, and faculty Manager at Brush High School. His family joined us during the football home opener two weeks ago as the first recipients of the award named after their father. The presentation happened between the first and second quarter of the game and the family was presented with a small artistic sculpture by District Athletic Director Mike Murphy. 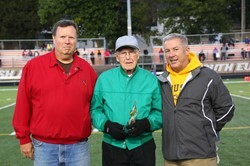 The second recipient was George Riser, he was presented his award during the John Adams game. George, Lyndhurst resident, was once the head football coach at Brush, but has gone on to fame as an Senior Olympian. He was named to the Ohio Senior Olympics Hall of Fame in 2007. He has assisted for years with Brush track meets, helping many Arc throwers along the way. Stay tuned throughout Football season as we post more about the recipients along with photos of the Love Award.